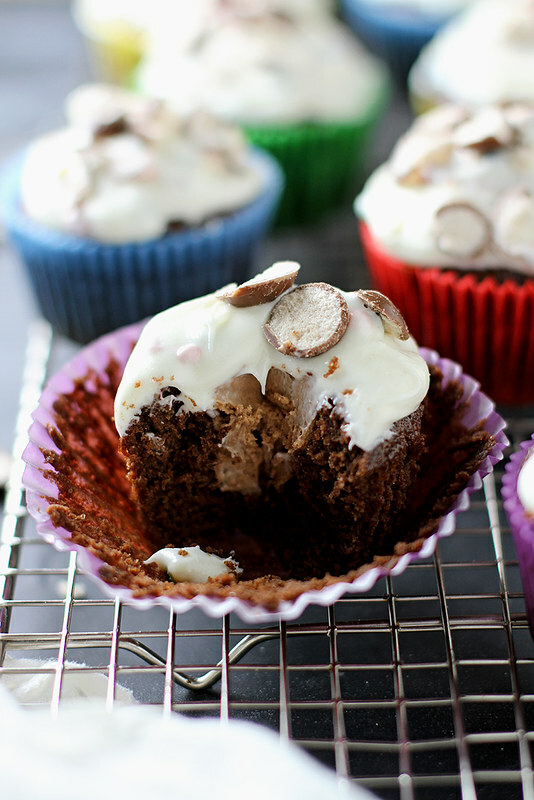 Question for you: What could be better than a malted chocolate fudge stuffed cupcake? 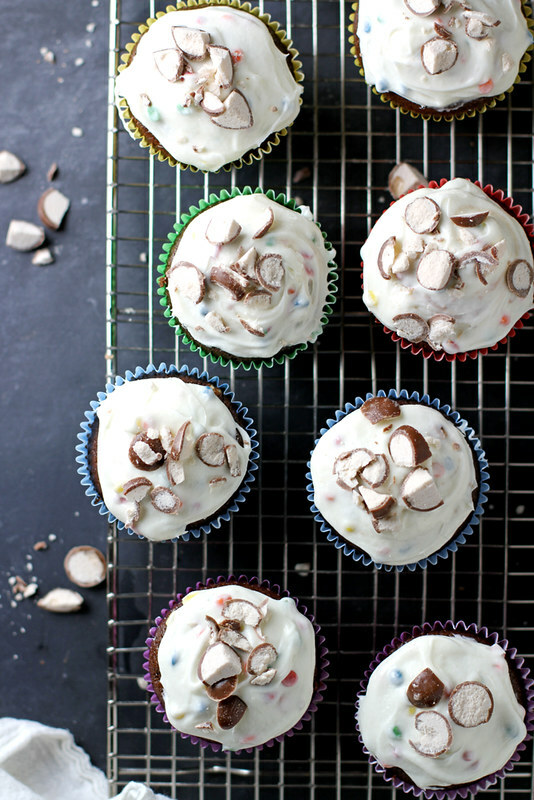 A malted chocolate fudge stuffed cupcake topped with RAINBOW CHIP FROSTING, that’s what. It’s back, you guys! 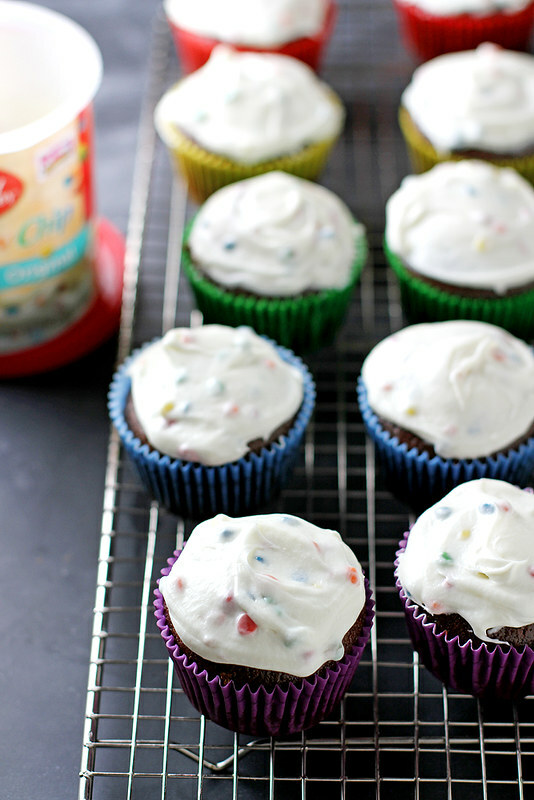 The frosting with the fun little rainbow-colored chips is back! I could do a jig about it, I’m so happy. But to save us all from that embarrassing display of affection, instead I will eat a cupcake in celebration. Actually, make that two cupcakes. 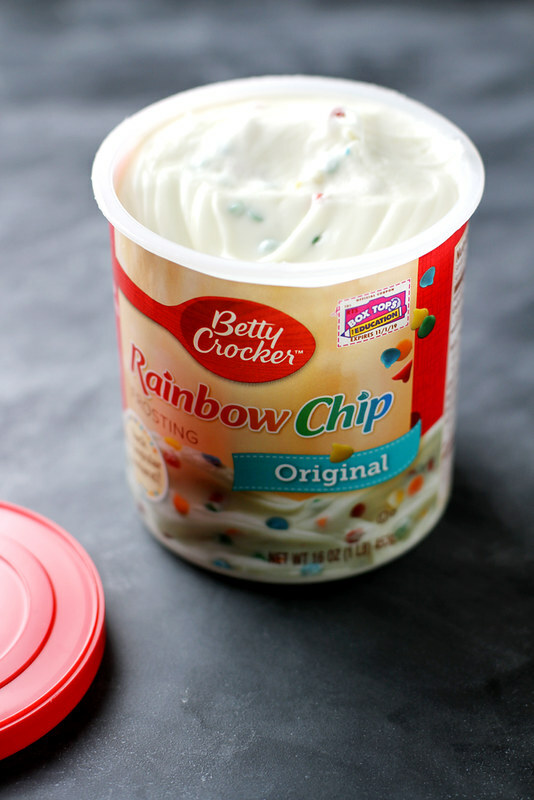 I’m not the only one excited about Betty Crocker’s Rainbow Chip Frosting’s triumphant return. There are Facebook groups with more than 15,000 fans, a change.org petition with more than 6,500 signatures and hundreds of pleas per week sent directly to General Mills for the return of the beloved frosting. That’s some serious affection right there. And Betty is listening, which is why they are bringing it back to the masses. To commemorate the re-release of the good ol’ Rainbow Chip, I made these fudgy malted chocolate cupcakes stuffed with a chocolate malted frosting and topped with Rainbow Chip frosting and crushed malted milk balls for good measure. All together it makes for one tasty cupcake reminiscent of a chocolate malt with a hint of creamy vanilla. YUMMAY. These cupcakes just exude happiness for me and there are a few reasons why: For one, the double frosting. Because why just have frosting on top when you can also stuff a cupcake with frosting, amiright? For two, the dense chocolate cupcake itself. I like my cupcakes to be sturdy rather than fluffy, and this chocolate cake base is exactly that with a decadently fudgy flavor. And for three, the crunchy malted milk balls on top combined with the rainbow chips in the frosting. That texture paired with the fluffy frosting-filled center and dense fudgy cupcake is so on fleek, I can barely handle it. I might have to eat another cupcake just to deal. Now here’s the sad news: Rainbow Chip frosting is not yet available in stores. I know. BUT the good news is you can be one of the first to get your hands on it (plus some other goodies!) by entering the Betty Crocker sweepstakes! And if you do, you should make these happy cupcakes immediately. It’s the right thing to do. Sooooo this is what they mean by “eat the rainbow,” right? Heat oven to 350 degrees F. Place 24 paper baking cups in 2 standard muffin tins. In a large bowl, whisk flour, sugar, malted milk powder, baking powder and salt until well combined. In a separate microwave-safe bowl, melt chopped unsweetened chocolate and butter in microwave on full power 1 minute; stir, then heat in 30-second intervals at 50% power, stirring after each interval, until mixture is just melted and smooth. Add chocolate mixture along with oil and 1 cup milk to dry ingredients; stir until just combined. In a separate large bowl, beat eggs lightly, then stir in remaining 3/4 cup milk and vanilla. Add to batter and stir until just combined. Divide batter evenly among baking cups (each cup should be about 3/4 full). Bake 25 minutes until a toothpick inserted in the center of a cupcake comes out clean. 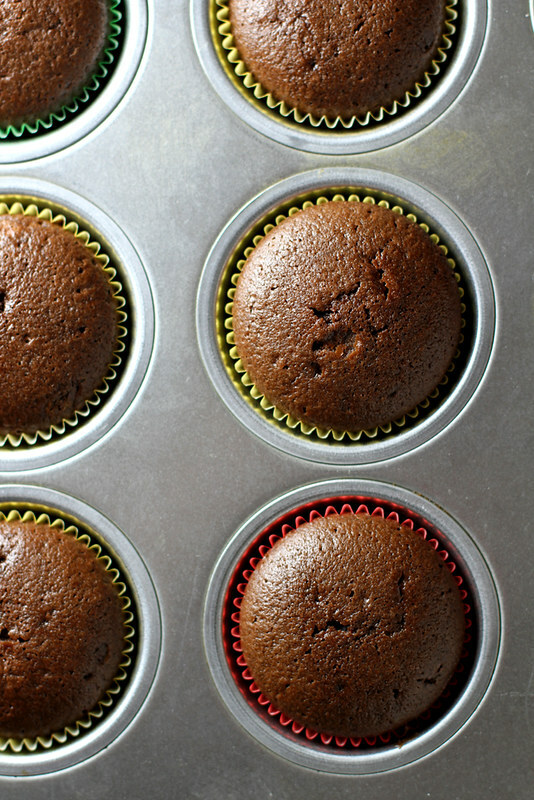 Cool cupcakes 5 minutes in muffin tins, then transfer to a cooling rack to cool completely. Meanwhile, make the filling: In a large bowl, beat butter 1 minute until light and fluffy. Add powdered sugar, malted milk powder, melted chocolate chips, heavy cream and vanilla. Stir, then beat 1 to 2 minutes until well combined, smooth and fluffy. Use a spoon or scoop to hollow out center of each cupcake. Carefully fill each cupcake with a generous tablespoon of filling. 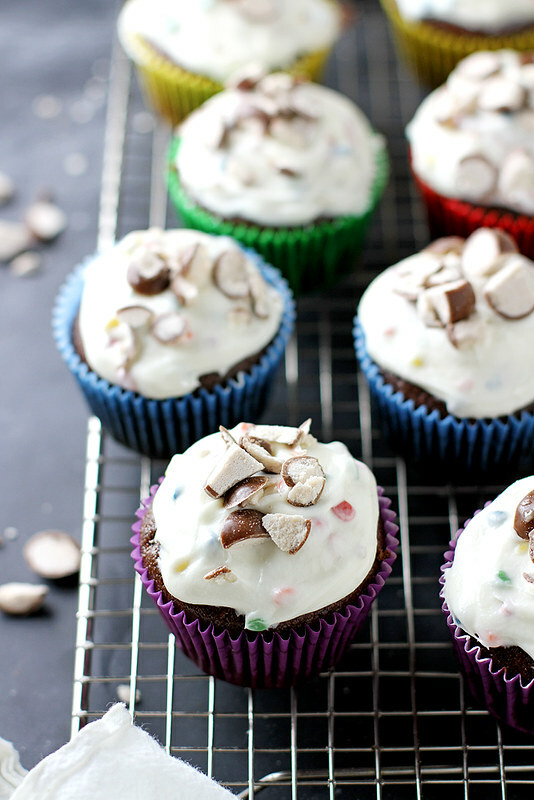 Use a spatula to frost tops of cupcakes with Rainbow Chip frosting, then sprinkle chopped malted milk balls on top, if desired. Disclosure: I received compensation from General Mills for recipe development purposes. All opinions are my own. Wow, Stephanie! These look so yummy. I just want to face plant into the screen and into that beloved fun frosting! I’m loving that you’ve stuffed them with frosting too. Can’t go wrong with that! YAAAY. Baking + rainbows is like the happiest thing I can think of! Chocolate fudge stuffed cupcakes?! Oh my word. Pinning! 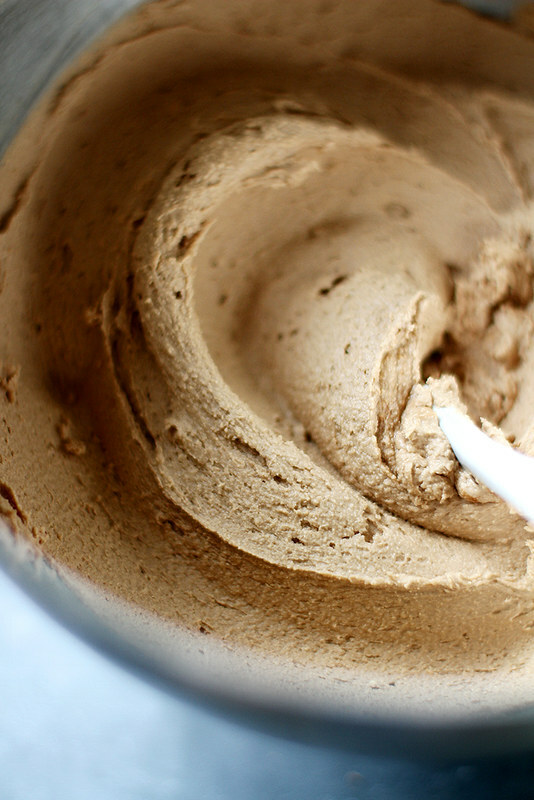 This recipe….you had me at ‘chocolate malted’. Need malt powder stat. Will send son with new drivers license to the store! Say it ain’t so! My old rommate and I were OBSESSED with rainbow chip icing on top of what we affectionately refer to as, Dot Cake (funfetti)! These cupcakes look absolutely amazing, with all the malty fudgy decadent flavor plus the pretty rainbow frosting. I’m texting my friend RIGHTNOW to let her know the good news! These look completely delish! That filling sounds divine! I like fluffy cupcakes like this too! This flavour is calling my name!! Rainbow chip is the best! These are such happy cupcakes I love them!! That chocolate malt filling is everything!! So these were what I was lusting over the other day on Instagram! Malt = love. This looks so fun! Also, HOW HOW HOW are your cupcakes so perfect?! Rainbow chip makes everything better! 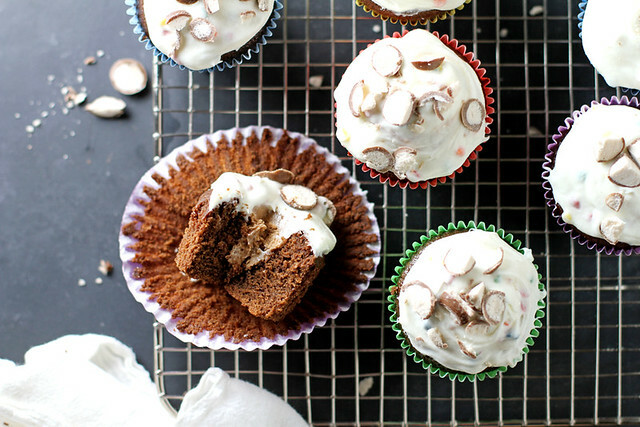 Love these pretty cupcakes and I’m totally lusting over that chocolate malt filling! I just died. The deliciousness is too much. There is nothing better than rainbow chip frosting…nothing! Love these cupcakes to death. Loving that rainbow chip frosting!! 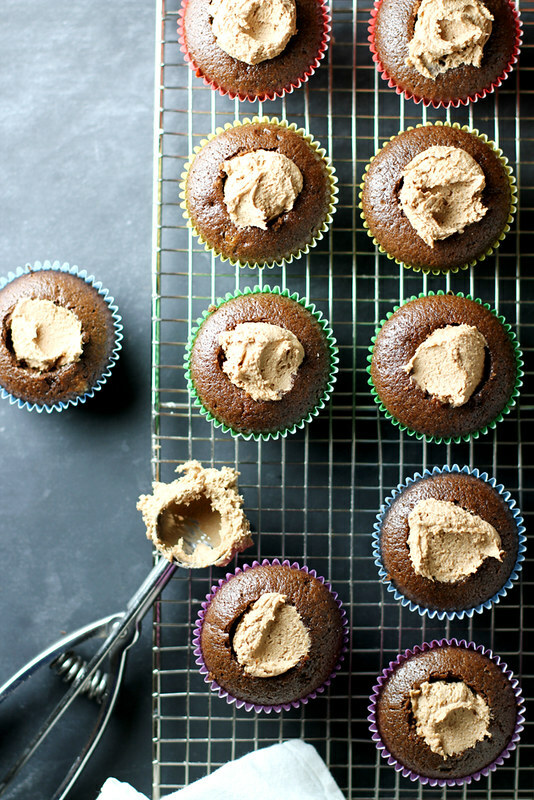 Fudge stuffed cupcakes sounds like the best thing ever too! These are MEAN cupcakes! Because I know I won’t be able to stop myself lol! RAINBOW CHIP FROSTING?! A kid’s dream!!!! and the malted chocolate fudge. . MY DREAM! love these cupcakes! STOP EVERYTHING RIGHT NOW! When and where will this frosting be available again?! Kelli — Unfortunately I do not know — but soon! ohmygod! How have I not seen these!!! I’m in love with anything malted so you got me. Making these….for breakfast. Don’t judge.